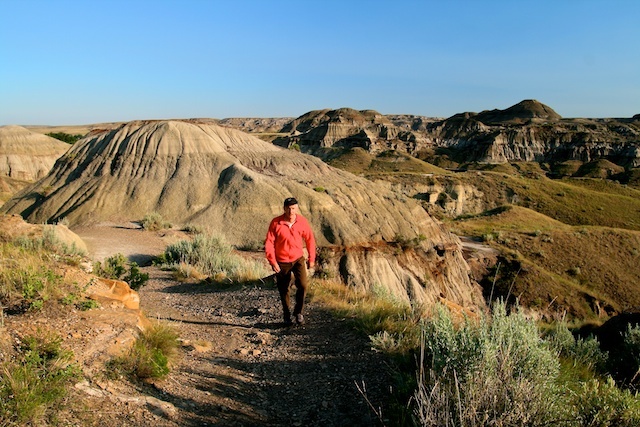 From a tourist perspective, Brooks is best known for its location on the Trans-Canada Highway, between Calgary and Medicine Hat, and for its proximity to Dinosaur Provincial Park, a World Heritage Site famed for its dinosaur beds and badlands. In recent years, Brooks has grown from a southeast Alberta farm town into a small city (population 14,000), with a considerable workforce from sub-Saharan Africa at a large meatpacking plant. The city’s cuisine has also expanded to include reputable Thai and sushi restaurants. But I’m in the mood for the old-time hotel bar scene that Alberta’s small towns are famous for. And the Brooks Hotel (“Established since 1909”) doesn’t disappoint. The wood paneling’s dark, the lighting dim, with the only glow coming from a row of automated gambling machines. Early-afternoon patrons are nursing bottles of Bud, Miller and Kokanee and digging into mountainous sandwiches. Which is what I’m here for. The waitress rattles off half a dozen varieties, and I pick a loaded roast beef, stuffed between two ridiculously thick slices of fresh, soft French bread. It’s $6 for a pound of food, $1.25 more if I add soup. While I’m waiting for my takeout, she asks if I want a glass of ice water or soda: “Slice of lime or lemon with that?” Unpretentious, friendly, incredible value and the kind of roast beef sandwich your mother used to make. What’s not to like? This entry was posted in Alberta, Alberta restaurants, Brooks, Dinosaur Provincial Park, UNESCO World Heritage Site and tagged Brooks Alberta on August 9, 2013 by bcorbett907. I’d had a sandwich there a number of years ago while updating my Day Trips From Calgary book. Just as good this time around. The Brooks Hotel believed in the quality of their sandwiches so much, that they BOUGHT THE BAKERY to keep it going with it was struggling to stay solvent. Ummmmm……They shut down the bakery. That’s how much they don’t believe in their sandwiches. They ship in the bread. great review! any chance we could run this in our local paper? Ok! I’ll pass it along to the editors of The Brooks Bulletin, and if they run it, I’ll let you know the date? 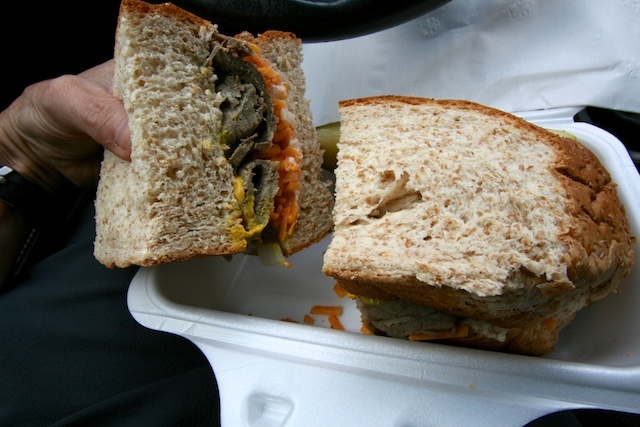 Ok. Let’s get one thing straight….this unremarkable bit of grocery store sandwich meats placed inbetween two overly large slices of unremarkable bread is NOWHERE near as famous as some people would like you to think it is. Just google it. This is the first hit….and it’s on the third page! Hardly famous. It is all store bought and slappped together by the next bartender the can convice to hire. People think it’s so big, but it’s all bread. Not so smart, those people are. It reminds me of that old Wendy ‘s commmercial, “where’s the beef?”. Next time I would definitely recommend hitting Wasana Restaurant, now that’s a small business in Brooks that’s dishing it out!